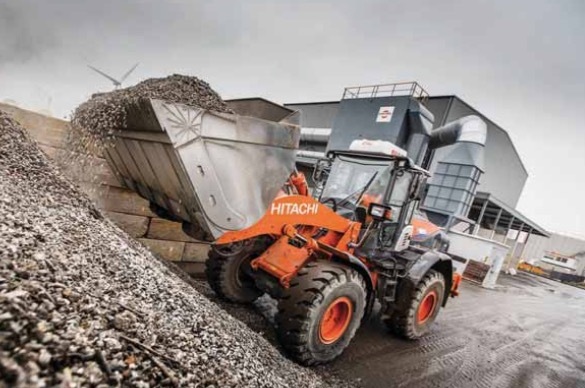 A fleet of Hitachi wheel loaders and excavators is providing crucial support to Heros Sluiskil BV (Heros), a facility in the Netherlands that extracts valuable raw materials from incinerated domestic and industrial waste for reuse. Heros has been a loyal Hitachi customer since 2011 and now has a fleet of ten machines including a ZX350LC-6 excavator and nine ZW-6 wheel loaders. During its ‘urban mining’ process, Heros extracts ferrous materials such as iron, and non-ferrous metals such as aluminium and copper, from incinerated bottom ash. The remaining material forms the basis for the production of high-quality secondary aggregates, used for example in road construction or concrete products. On the challenging 45-hectare site, the Hitachi machines are used to carry out a variety of tasks. The ZX350LC-6 medium excavator is used to open up the stockpiles of incinerated bottom ash, which can be stored on site for three to six weeks. One of the ZW310 wheel loaders takes material from the pile and transports it to the feeder of the separation and processing equipment. A ZW250-6 works in another section, where scrap metal is separated, while the company’s largest wheel loader, a ZW370-6, is used to unload material from ships that dock in the adjacent canal. The smallest Hitachi wheel loader on site, the ZW180-6, works for 16 hours a day in the 2,700m2 non-ferrous upgrading facility. To ensure the highest level of support, the machines are provided with full maintenance and service contracts, and extended warranty from Hitachi’s local dealer Pladdet (a sub-dealer of Hitachi Construction Machinery Nederland), which is conveniently located 20km away. “Reliability and service nearby are the most important things for us,” says David.